Chinese culture flourishing for thousands of years, the cultural spirit is Chinese. With the popularity of Chinese elements in the world, in order to know more Chinese culture more and more foreigners learn mandarin and come to China to do business, study, travel, and make Chinese training gets rapid development. Under the background of the era of the economic globalization, cultural diversity,and democracy in international relations, friends from all over the world to enter the Chinese market, foreign companies to invest in China project, carry out cooperation. In the enterprise, there are a lot of foreign personnel is weak in Chinese level, and do not know much about the Chinese style of doing things, business etiquette and communication, in the process of work. It's easy to appear communication barriers, ambiguity, reduce work efficiency because of the language impassability. Enterprise personnel need to properly learn Chinese, to reduce the communication cost, and promote the internal communication, and strengthen the external business communication. Shanghai Chinese education has gradually developed into a mature system, in Shanghai for foreign friends in Shanghai to know and understand the Chinese language and culture provides a large platform, deepened their liking for Chinese culture, to help foreigners learn mandarin, feel the unique charm of Chinese literature and the humanities. 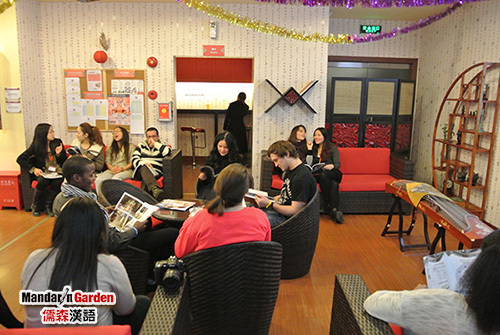 MandarinGarden in teaching foreigners Chinese, will be open for them some lectures on studies of Chinese ancient civilization class and literature, to help them improve Chinese accomplishment, increase language sense.